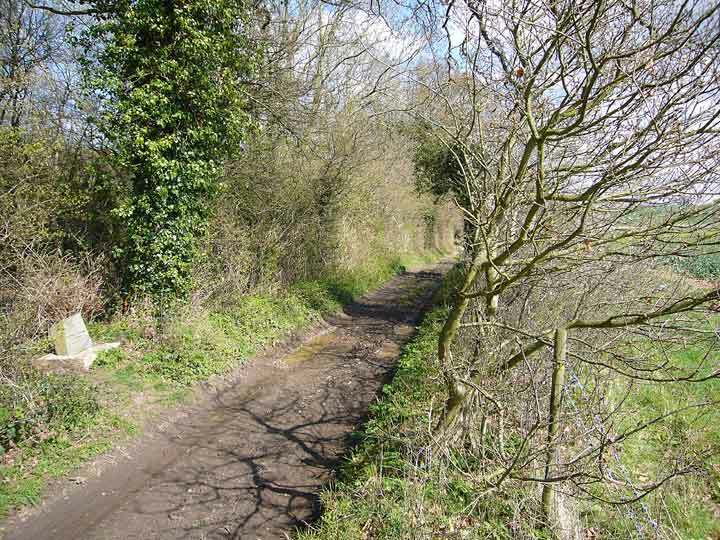 An unexpected sight on a quiet path in the English countryside near the village of King's Somborne in Hampshire. What is the story? 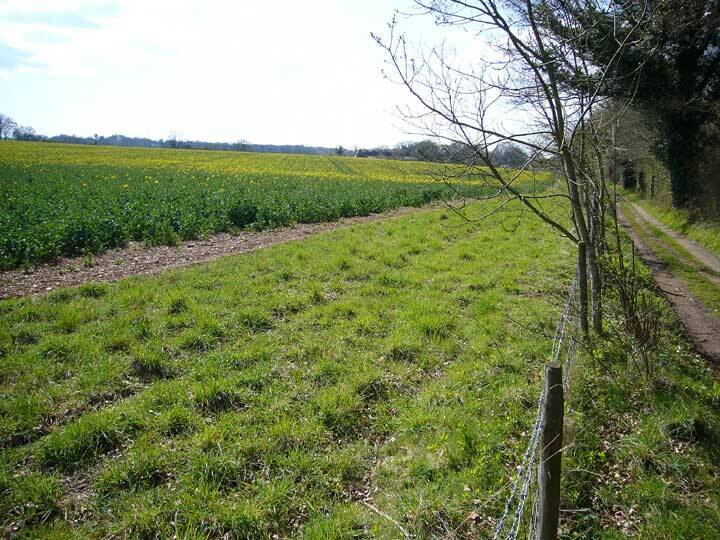 A trawl of the web and subsequent email contacts revealed that a German bomber, a JU 88, was shot down in this area. The plane crashed, burst into flames and all the crew were killed. It was returning from an attack on Abingdon airfield near Oxford and was shot down by a Spitfire from Middle Wallop airfield nearby. Two Spitfires were involved, one piloted by the fighter ace P/O Bob Doe and the other by Squadron Leader J.O'Brien. 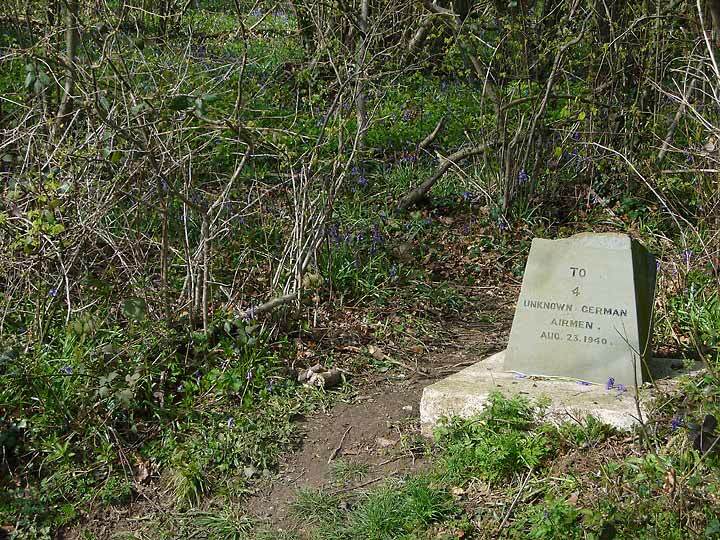 The bomber did not actually crash at this site but a mile or two away on the north side of King's Somborne. And the date was the 21st and not 23rd August 1940 as stated on the stone. The memorial was placed here in 1951 and the slight mistake in the date may be because the 23rd was when it was reported in the local paper. Since the stone was placed there, the identity of the four airmen has in fact been established. A detailed account follows below. The following article by Mary Pollock is the result of her extensive research. It appeared in the Hampshire Magazine in April 1997 and was based on two articles for the Newsletter of the Somborne and District Society which appeared in Autumn 1994 and Winter 1995. It is reproduced here by kind permission of the author. 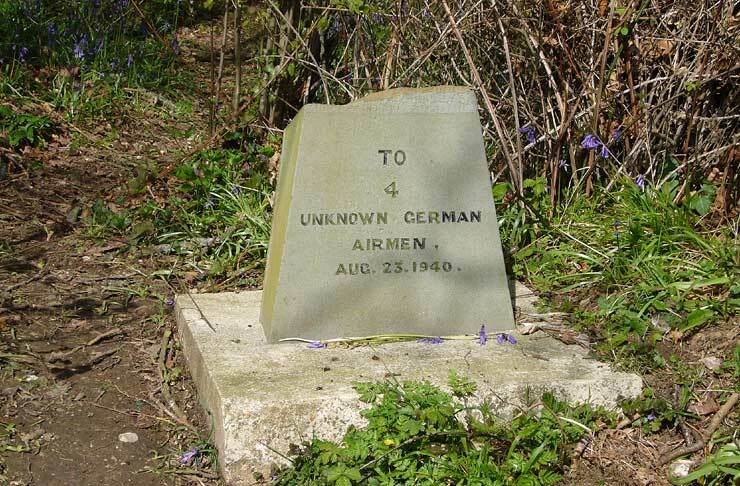 ( ... ) About the memorial stone to four unknown German airmen, which lies on the Roman Road south of King's Somborne. Walkers on the old road stop to read the inscription. Strangely, the German plane did not crash at this spot, nor did it crash on the 23rd August 1940 as stated on the stone. Using both British and German sources, here is the story behind the stone as far as I am able to put it together. Tantalisingly, some parts of the story are still missing. They were the crew of a Junker 88 that was part of Staffel I of Kampfgeschwader 54, then based at Evreux west of Paris. This squadron, known by the nickname "Totenkopf" (Death's Head), was part of Luftflotte 3, under the command of Hugo Sperrle. On the 21st August, five Ju.88s of Staffel I and seven Ju.88s of Staffel II, took off from Evreux between 12.48 and 14.32. The target for Staffel II was the Supermarine Aviation factory at Woolston, while the target for Staffel I was the air-field at Brize Norton. However, due to bad weather conditions, they made for their secondary target of Abingdon, which, according to German records they attacked "with good effect", and it was on the return from this mission that the plane, which was to crash at King's Somborne, was intercepted somewhere near Newbury, by not one, but two Spitfires of 234 Squadron based at Middle Wallop. Three Spitfires of A Flight had scrambled at 13.20. They had already been scrambled earlier that morning. In Red 1 was Squ. Leader J. O'Brien, Red 2 was piloted by Ft. Lt. C.L. Page and Red 3 by P/off. R. Doe. Squadron 234 had only arrived at Middle Wallop between the 13th and 15th August. Although the German plane tried to utilize cloud cover as much as possible, it had little chance against the combined efforts of O'Brien and Doe. In their Combat reports, both pilots claimed that they had closed in on the German plane at distances from 50 to 30 yards. Squ. leader O'Brien also reported that by the time they closed in for the final attack, all answering fire from the Ju.88 had ceased. This, together with bloodstained bandages on the ground, gives credence to the idea that the crew were probably dead before the plane, losing height and speed, hit the ground at a low angle. The plane crashed just north of the village near the Stockbridge Road. As the two R.A.F. planes broke cloud cover after the final attack they saw the Ju.88 already burning on the ground below them. The time was 14.15. Five minutes later O'Brien and Doe's Spitfires touched down, followed at 14.25 by the plane flown by Fl. Lt. Page, which had taken no part in the attack. The Official Squadron Report states, "One interception, scramble by 3 aircraft. A Ju.88 shot down by Squ. Leader O'Brien and P/O Doe." The first official reporting of the crash to the appropriate authorities seems to have been made by Mr. Potter, who was then Vice-chairman of the Parish Council. He added that the Warden was on his way to the crash. An hour after the impact, the burning wreckage was being controlled by the Police and the military. It was also noted that no crew had been saved. As the crash had happened so close to base, the R.A.F. pilots decided, on the Squ. Leader's suggestion, to come back to view the wreckage. Bob Doe later said that he was sorry that he had done so: it brought death a little too close for comfort. Later the pilots visited the Crown Inn. I wonder if anyone bought them a drink. I have been told that a party of 200 Australians, under canvas at Lopcombe Corner, were route-marched on the day after the crash to view the wreckage at King's Somborne. I have been unable to find any confirmation of this event: the arrival of two hundred Australian visitors to the village must have caused some comment, but perhaps they were not permitted to approach the village centre. Although I had heard something of the German plane, my interest had not really been aroused until I helped in the week-long celebrations which marked the 150th anniversary of King's Somborne School. It had been arranged that School would be open on the Wednesday evening to give those at work a chance to see the Exhibition. While I was stewarding in the hall, I was amazed at the number of men, former pupils of the school, who went immediately to one particular window and said, "That's the window where we watched the German plane come down." After the crash, all the boys, save one, who to his ever-lasting regret, had been detained by Mr. Gomm, the Headmaster, dashed out of the School, and following the cloud of smoke, made for the Stockbridge Road, hoping, no doubt, to be the first on the scene. Soon a crowd of spectators, controlled by Charlie Wykes, the village policemen, who was alert to the possibility of unexploded bombs, crouched behind a low bank about 200 yards from the fiercely burning plane. On being assured that the suspected unexploded bombs were in fact oxygen cylinders, the crowd edged forwards, but the sights, and the smell were too much for some. Many of the King's Somborne boys were eager to acquire "souvenirs" which they could proudly exhibit to their friends, and it is quite likely that some of these trophies lie, half-forgotten, at the back of drawers in some King's Somborne homes today. The girls, meanwhile, remained at School, with Mrs. Matthews, who must have surprised, and possibly alarmed the girls, by bursting into tears. She explained to the girls that the men on board the plane were "somebody's sons". Some of the older girls were to remember that one of Mrs. Matthews sons was already serving with the R.A.F. After the crash, one village boy went home to an evening meal of liver, beans and potatoes. He told me, that even now, he cannot eat liver without recalling the stench of the burning plane. 15 When I first wrote about the crash in an article for the Newsletter of the Somborne and District Society, many people queried the fact that the children were in School on that August afternoon. The answer is quite simple. Because of the war-time emergency, the school summer holiday had been reduced to a fortnight. School re-opened on the 12th August, and because of the large number of evacuees in the village (at that time, a total of ninety) and alternative system of education had been introduced, so that village children attended school on Monday, Wednesday and Friday, and evacuees on Tuesday, Thursday and Saturday. Thus the local children were in school on that Wednesday afternoon. Incredibly, there were no air-raid shelters at King's Somborne School: instead the children filed out of the school into the "safety" of the Church. As the children were still in the school building that afternoon, it would appear that the air-raid siren had not been sounded. Due to paper shortages, copies of the Andover Advertiser in 1940 consisted of four double pages. There were plenty of adverts but no photographs, and in the interest of National Security, items were scrutinised carefully so that no information in them could be of use to the enemy. This sometimes resulted in news being reported weeks, or perhaps months after the event. In spite of many inaccuracies, we may be fairly certain that the report in the Andover Advertiser of 23rd August, about a Heinkel being attacked and brought down in a field of mustard near a Hampshire village refers to the plane which crashed, in a field of mustard, in King's Somborne. A fortnight after the crash, Squ. Leader O'Brien was dead. He was shot down and killed during the heavy raid on London on the 7th September (Black Saturday). He was 28 years old and had taken command of 234 Squadron on the 17th August. He is buried at St. Mary Cray Cemetery near Orpington in Kent. His father also had been killed on active service, in France in 1917. For Bob Doe, aged 20, the Ju.88 at King's Somborne was his fifth "kill". He played a very active role in "The Battle of Britain", and was twice seriously injured. Following his second accident he was taken to Park Prewitt Hospital, where he underwent plastic surgery under the care of Harold Gillies. After a distinguished career, Bob Doe left the R.A.F., as a Wing Commander, in April 1966. He wrote a book "Bob Doe, Fighter Pilot". Francis Mason, the author of "Battle of Britain" regarded him as being among the top seventeen British and Allied pilots who achieved ten or more victories in "The Battle of Britain". Bob Doe, together with some of his Battle of Britain comrades appeared in a film made for television to mark the 50th anniversary of the Battle. Cyril Leslie Page, the third pilot, left the R.A.F. as a Squ. leader in 1947. In September 1950 something strange and very sad happened. Three letters arrived in the village from Germany. The Chairman of the Parish Council stated that Mrs. Cecil Barker had received a letter from the parents of a German F.Lt. whom they thought might have been shot down here and were anxious to trace their son. The Clerk said that he also had received two letters from Germany making enquiries, one written in German, and one addressed to the Town Mayor. At that time, the names of the four men were still unknown, and there is no way of knowing if any reply was sent to these anxious parents, but certainly they appear to have received some sort of information, which prompted them to write to (what must have been for them) a hitherto unknown village in Hampshire. Mr. Bowyer, Secretary of the local branch of the British Legion, raised the idea of a memorial stone to the four Germans at a meeting of the Parish Council in 1948, when the Parish Council were discussing arrangements for the names of those killed in the 1939-1945 war to be placed on the village War Memorial. It was suggested that an approach should be made to the Kriegsgräberfürsorge (the German equivalent of the War Graves Commission). Nothing more happened until October 1950, when Mr. Bowyer applied for permission for "a standard cross to be erected in the cemetery" ( to the German airmen). After discussion the Vicar suggested that a Parish meeting should be called and that the Council should be guided by the decision of that meeting. The Parish Meeting was held in the School on 30th October, 1950. The Romsey Advertiser reported how "the younger element of the village peered in the windows, as their elders crowded into the Schoolroom." That the Meeting was of considerable interest is shown by the fact that reporters from several of the National newspapers were present. Coming so soon after the cessation of hostilities, it is not surprising that the atmosphere was highly charged. The Chairman of the Parish Council, Mr. C.B. Scott, explained that the meeting was called to decide if permission should be given to the German War Graves Commission to erect a cross in the cemetery. After much discussion, Mr Goodwillie proposed that "We forgive and forget, and no action be taken." However, an amendment made by Captain Rivenhall Goffe, " We are agreeable to have the memorial in the cemetery" was put to the vote. It was defeated by two votes - 26 voting for, and 28 voting against the amendment. Mr. Goodwillie's resolution was therefore carried. During the meeting Mrs. Flora Firbank of Hoplands pointed out what the consequences could have been if the plane had crashed in the village, and at the close of the meeting she stated that she was willing for the memorial to be erected on her lands at Hoplands. As a local reporter wrote, "A long drawn out controversy was at last settled." The controversy, however, was to rumble on in several letters written to local papers. In 1950, the King's Somborne branch of the British Legion appears to have a good membership, and at their A.G.M. 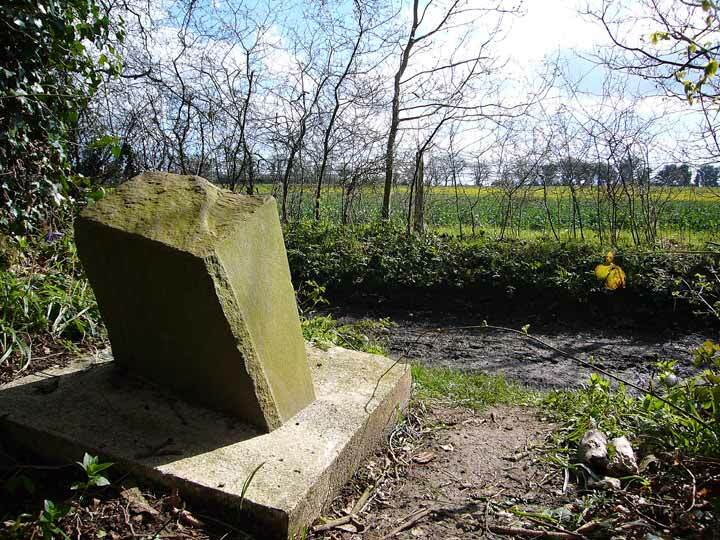 held in January 1951, it was stated that a memorial stone to the four German airmen had been "procured". The Vicar proposed that the stone should be erected near the Roman Road, on the Hoplands Estate at the point above which the combat was fought. I have been unable to find out when the stone, bearing the wrong date, was put in position, but it must have taken place in the Spring of 1951. There was a short Act of Remembrance, during which a small posy of flowers was placed at the stone by the young grandson of Mr. Bowyer. Over the years, various hands have laid small posies of flowers there. A recent letter shows that the German authorities are aware of the presence of the stone. Note: The author has no information on where the airmen were buried. * in paragraph 2: Max corrected to Dankward, in accordance with German War Graves details kindly provided by David Green of the New Forest Military Archive 4 July 2010. The Librarian, Middle Wallop Airfield.